A massive 40-bunk Great Walk hut on the Kepler Track. 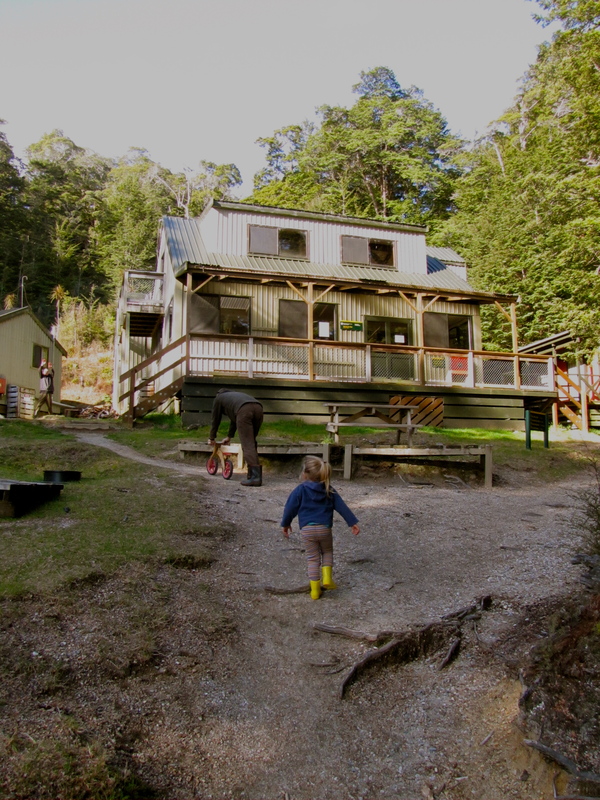 Access: A wide, well-maintained track of about 6km from Rainbow Reach to Moturau Hut. Our 2 1/2 year old managed to walk/bike nearly the whole way and it took around 3 3/4 hours. Adult walking time is about 1.5 hours. The track has a few things to break up the trip for kids – big swing bridges, viewing platforms into/across swamp, pest traps to check. Hut features: Well-maintained hut, fully serviced in high season. Plenty of space to spread out and keep out of others way during off-season. Screens on windows. Woodburner. Plus there’s also Shallow Bay Hut around the corner (about 2km away) that you/others could bail to if things are going well. Beautiful lake and beach. Negatives: Cost in high season (Labour Weekend – Easter; $54 per adult, children free). Possibly pretty cold in winter as large hut. Sandflies (not so bad round the corner at Shallow Bay). Visited by the Clark family, Sept 2015.